The latest version of Pokemon Go++ ipa for iOS is released. This hack is also known as PokeGo++ 2.0 ipa iOS. There are new improvements in this version. Luckily for iOS users, Pokemon Go 1.99.3 can be hacked via Pokemon Go++ hack also called Poke G0++ ipa iOS. This hack can be installed without jailbreak on an iPhone and iPad. You just need to follow the instructions below. Cydia Impactor a tool that is used to install unsigned sideloaded custom apps on iPhone and iPad without jailbreak access. The new Pokemon Go update update comes with some new features like whenever you catch a pokemon of specific type you get a Catch Bonus. Similarly you can now bring up to Six pokemons in a friendly Gym battle. Moreover there have been Audio improvement, bug fixes and Egg and Incubator screen update. To install the Pokemon Go ++ hack on 1.101.0 version on iOS. Read further below. Poke Go++ 2.0 hack can installed for Pokemon Go to bypass real life walking. You will have a joystick for moving around. But since Pokemon Go is an online augmented reality game. There are chances that these hacks would get you softban because Niantec’s Antihacking system is pretty tough. You can also use Tutuapp to hack Pokemon Go without Jailbreak. On Android tutuapp has stopped working now but Fly GPS can be used instead. Now let us begin with Pokemon Go++ hack using Cydia Impactor. Follow the instructions below. For doing the process you will need a PC or Mac and iPhone/iPad device running latest iOS version. For More cracked IPA files for iOS, do checkout our another website, ipadownload.com. Delete any previous pokemon go before installing the latest one. Follow these instructions below install Poke Go++ hack on your device. First, Download Cydia impactor on your windows PC or MAC. Now download the latest Poke Go++ ipa hack file from above link and extract to get ipa file. Now Click on the Poke Go++ Hacked ipa file. Drag it and drop it in Cydia impactor. Note: Delete any previous Pokemon Go installed from your phone. Now, that the ipa file is installed on your iPhone/iPAd. You can disconnect the device from he computer. 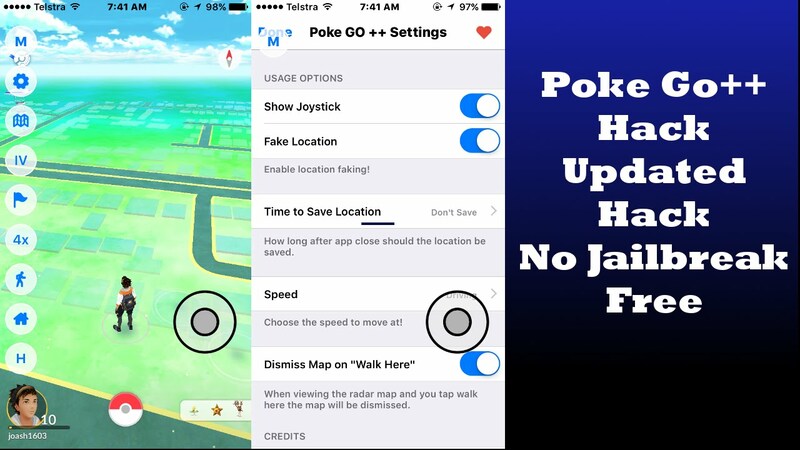 Hope you like this tutorial to install Pokemon Go++ hack on iPhone or iPad. Drop your comments below. Please share it and subscribe to our blog. Pokemon Go++ is a hacked Pokemon Go ipa file for iPhone. You get the joystick in Pokemon to bypass real walking in Pokemon Go. To install this hack aka Poke Go++ ipa for iOS, you need cydia impactor. Above are the steps explained to install this hack. I did every step correctly and unfortunately, the Pokémon Go application does not contain a joystick. It installed the basic application only. Not sure why. While installing, I was alerted that there was an update in order to continue signing in. Perhaps this is the problem. I’m having the same issue. Says update to continue on all downloads I’ve tried. Still not working. Still trying to force update the app. pls update the latest version 1.23, TQ ! any new update version for Poke Go++ ? any new update 1.21 for ios device? Why when I try yo sign in Cydia impactor at step 5, I always get error: provision.cpp:150, please sign in with an app-specific password. you can create one at appleid.apple.com. I use the right pair of my apple user id and password. Anyone can help? thanks. pls fix it.. tq very much..
that link the old 1.17 link and not 1.19 link..
Dec 7 link seems to be the old 1.17 link and not 1.19 link. Please check. Thanks. Thanks, moreover the application is coupled with GoRadar ? How to move to another place without being banned ?